Thousands of Norwegians gathered in front of Norway’s festively decorated Parliament Building on Thursday to kick off public celebrations of their constitution’s 200th anniversary. Inside, the royal family joined in singing as a festival of bicentennial parties started rolling through the country. It was no coincidence that an elegantly dressed choir up in the Parliament’s balcony wrapped up the festivities inside with the traditional song Det går et festtog gjennom landet (literally, A party train is rolling through the land). 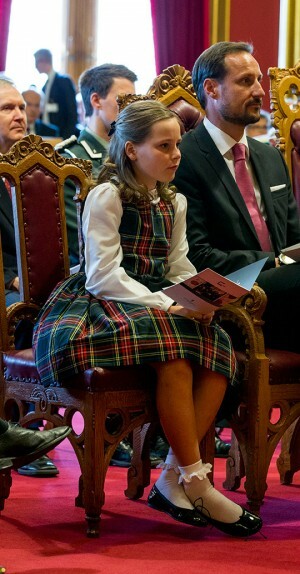 Among those singing was Princess Ingrid Alexandra, the 10-year-old heir to the throne one day after her father, Crown Prince Haakon, and her grandfather, King Harald. They were all there for the commemorative session of Parliament, plus Queen Sonja, Crown Princess Mette-Marit and the king’s sister, Princess Astrid. Their presence actually violated a clause in the constitution that, since 1884, has made it clear that the monarch has no place in the Parliament among the people’s elected representatives. King Harald formally opens the Parliament every year, but isn’t supposed to be there when the parliament actually meets. In this case, though, he and his family were specially invited guests, just as they’ve figured prominently in bicentennial events that began in January and will continue through the year. This week and next, however, mark the climax since the Norwegian Constitution was actually signed at Eidsvoll, north of the capital, on the 17th of May in 1814. The party will really take off on Saturday, during traditional 17th of May memorials and parades all over the country, when the royal family spends hours waving from the balcony of the palace in Oslo. 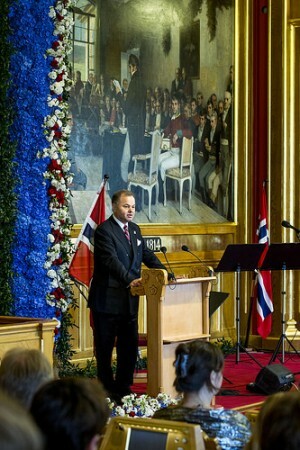 The formal partying began Wednesday night in Oslo’s City Hall, when Oslo Mayor Fabian Stang hosted Norway’s roughly 400 mayors and the royal family at a festive dinner. Many of the mayors were among those standing in front of Parliament on Thursday before they all headed to the palace themselves for a reception hosted by King Harald. For everyone else, there was outdoor music, entertainment, cake and a major exhibit of Norwegians wearing folk costumes (called a bunad) from all over the country. See more photos from the outdoor party here. There will be other parties of a more private nature in the days to come. Graduating students known as Russ will gather for their last all-night celebrations on the eve of the 17th of May, while wealthy hotel investor Petter Stordalen has once again invited many members of Norway’s jet set to his annual bash, which always is based on a certain theme. This year he’s building a replica of the Royal Palace in his garden, with guests expecting him to be waving from its balcony. Queen Margrethe of Denmark and King Carl Gustaf of Sweden will also be arriving for weekend festivities, which continue well into next week as well.